Local miners in Katsina earn N246m from fertilizer production – Royal Times of Nigeria. 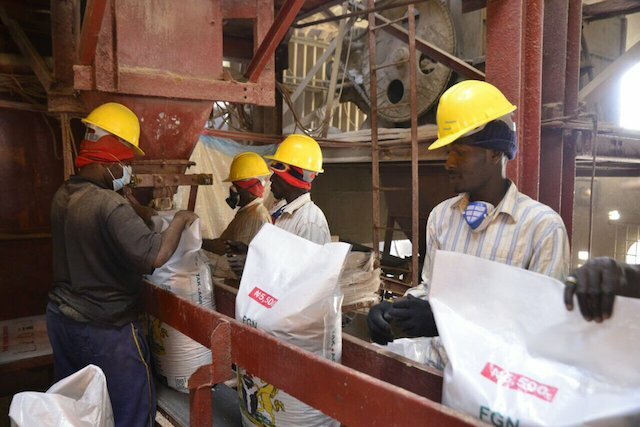 The Raw Materials, Research and Development Council (RMRDC), said on Tuesday that 79 local miners in Katsina State have processed raw materials for fertiliser production valued at N246 million in June. Mr Yusha’u Abubakar, an Assistant Director with RMRDC, made the disclosure in Kankara while presenting mining certificate to the miners umbrella body, Kankara Fertilizer and Kaolin Processors Cooperative Society. “Records indicates that 79 local mining companies registered under the umbrella of the cooperative society have produced 18, 420 metric tones of Kaolin, Marl, Talk and Red clay raw materials in different money transactions of N245, 600, 000 in the month of June alone,” Abubakar said. He said mining firms operating within Kankara Local Government Area have a combined workforce of 2,194 workers with 138 granulates excavating and processing materials for fertilizer processing companies. The official described the raw materials mined in the area of meeting international standard and advised the group to partner with relevant government departments to sanitize the business. He explained that the group was registered to ensure harmonious working condition and access to government funding and support. Also, the Federal Director of Mining in the state, Mr Samuel Amaechina, reiterated Federal Government determination to diversify the economy with focus on mining and agriculture. Amaechina urged all miners in the state to obtain licence and also register their companies with the Corporate Affairs Commission in accordance with the law. He told the miners that payment of requisite royalties to government coffers was mandatory, adding that a team of officials would visit them for collection of N1, 000 per granulate excavator as agreed. The director reminded the miners to adhere strictly to mining regulations, so as not to run foul of the law. According to him, mining obligations include adherence to environmental protections standards, improving social services of operational communities, avoiding disputes and accidents, payment of relevant taxes and others as stipulated by law. He also cautioned them against all forms of fraud and adulteration. Alhaji Idris Dragon, Chairman of the miners’ cooperative, expressed appreciation to the government for issuing them with the licence to operate and pledged that the group would abide by all mining regulations. He recalled that the miners had suffered various forms of humiliation and victimization before now. The chairman commended Katsina State Governor, Aminu Masari for including members of the society in the state’s empowerment loan schemes and issuance of land titles. Earlier, acting Chairman of the local government, Alhaji Bishir Maikano, and District Head of Kankara, Alhaji Yusuf Lawal, in their separate remarks, advised the miners to sanitise the business and meet set standards.